For a couple of weeks now, I have been leading up to this detailed look at the tax treatment of premiums paid and sums assured received under keyperson policies. At last, here it is. You can find extensive coverage of this and related subjects in our Techlink service (see www.techlink.co.uk). The rules for deductibility of premiums and assessability of the sum assured under so-called keyperson policies appear to be relatively well known. However, there have been a few relatively recent cases that make a review of accepted wisdom appropriate. First, let us look at the fundamentals of deductibility. There is no legislation that specifically deals with the tax treatment of premiums or the taxation of the sum assured. Reliance must therefore be had on general tax law provisions to determine deductibility and assessability. The sole purpose of taking out the insurance is the trade purpose of meeting a loss of trading income that may result from loss of the services of the key person, and not a capital loss. Guidance on possible non-trade purposes is at BIM45530. (NB: This means that any “duality of purpose” will prevent relief – see below for more detail). In the case of life insurance policies, they are term insurance, providing cover only against the risk that one or more of the lives insured dies within the term of the policy, with no other benefits. The insurance term should not extend beyond the period of the employee’s usefulness to the company. (the reference to the employee’s “usefulness” rather than a specific term of years, for example, five years, is helpful). The premiums on whole-life or endowment policies, or critical-illness or accident policies with an investment content – such that premiums contribute to a capital investment – are capital expenditure and will not be deductible, see Earl Howe v CIR  7TC289, page 300″. (This implies that premiums paid could be deductible under whole of life policies with no investment content. However, this would then be in conflict with the statement in the second bullet (above) that the polices must be term policies. It is thus thought to be the safer view that only premiums paid under term polices will be deductible). “Endowment policies on the life of a key person may be taken out as a condition of the provision of long-term finance. The premiums on such policies are not regarded as ‘incidental’ to obtaining the finance within the meaning of ICTA88/S77 (6), so are not deductible. ‘Incidental costs’ are defined in ICTA88/S77(6) as ‘fees, commissions, advertising, printing and other incidental matters’. The expenses listed form a class that would include any incidental costs of taking out a life insurance policy, but not the premiums, which are the cost of the policy itself.” (It is understood that this prohibition on deductibility would also apply to term policies to protect the loan). Let us now have a look at the taxation of keyperson insurance receipts – where premiums are allowable. As a general rule, whe both conditions outlined above are satisfied, the premiums will be deductible and sums received under such a policy will be income of the employer’s trade (CIR v Williams’ Executor  26TC23, page 37). But what is the position in respect of keyperson insurance receipts in respect of which premiums are not allowable? Receipts under that policy are not taxed as trading income. “However, whether particular receipts are part of trading income is a separate matter of law to the deductibility of expenditure. No assurance can be given that any future receipt will be excluded from Case I income even though the premiums are not allowable (Simpson v John Reynolds & Co  49TC693 and McGowan v Brown & Cousins  52TC8).” (This is the HM Revenue & Customs’ warning that gives most cause for concern and I will deal with this in more detail next week). You may recall, that Sir Callum McCarthy’s Gleneagles’ speech used historical references to make a point about how incentives drive behaviour and how the wrong incentives can have results that are contrary to the public interest. Amid an almost unprecedented year of financial crisis, 2008 was all about gilts. Northern Rock has revealed it will be taking its toxic assets and moving them to a separate ‘bad bank’. Fidelity special situations made its first foray into the UK market in 1979 with Anthony Bolton at the helm. Until his retirement almost 30 years later, Bolton built a reputation as one of the UK’s best fund managers and investors in his fund reaped handsome benefits. Guide: reporting to the Pensions Regulator — what and when? 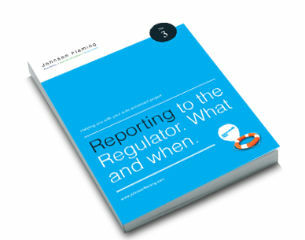 Johnson Fleming has published a step-by-step guide demonstrating the importance of record keeping and reporting, and how it can ensure you operate a successful scheme. The guide takes you through some key questions you need to ask and identifies the information you need to obtain. The topics include: why you need to keep records and the benefits of doing this; registering your scheme; what information you need to record to ensure you meet the Pensions Regulator’s requirements; and what items need to be recorded and when.